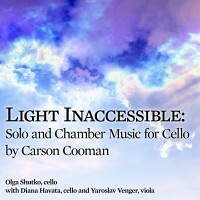 Light Inaccessible (2002) for two cellos was commissioned by and is dedicated to the Aradia Duet (Abigail Blackman and Emma Dixon). The title of the work comes from various Christian liturgies—particularly from the Eucharistic prayer: “dwelling in light inaccessible, before time and forever.” This provided some of the poetic imagery for the work. The first movement, Chiseled Plateaus, is built around assertive and dramatic gestures. The feeling throughout is rhapsodic. The second movement, Cold Horizons, is cast as a chorale with interlude. A somber and ponderous chorale opens the work. The interlude takes the material of the chorale and views it in new ways. Wisps of the familiar Welsh hymn tune Calon lan emerge from the texture. The chorale returns before a coda fades into silence. The third movement, Morning Sun, is energetic, with a lilting pulse. Two principal ideas (derived from the first movement) interact throughout. A brief quote from the first movement interrupts before the energetic music returns to conclude the work.